Bones are nutrient dense and make delicious soup but they take a long time to cook. The low heat simmering allows the nutrients in the bones to be released into your soup. Some of these nutrients are proline, glycine and glutamine. Bone broth is filled with tons of minerals and nutrients that are easily assimilated by your body. Nutrients such as glucasame and chrondoitin sulfate, yes the same thing you buy in a pill. Bone broth reduces inflammation in the respiratory and digestive system, improves the immune system and just plain makes you feel great. As we get older the collagen in our bones, skin and hair wears. Think about a baby, how soft and flexible not only their skin is, but also their bones. It is filled with collagen. How would it be to have a little bit of that flexibility back in your skin and bones? Just drinking a few cups a day of bone broth will do a lot to increase your health. 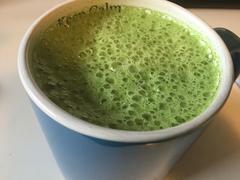 As shown below, adding nettles to your broth increases its nutritional load even more. What kind of bones do you use and how do you make it? 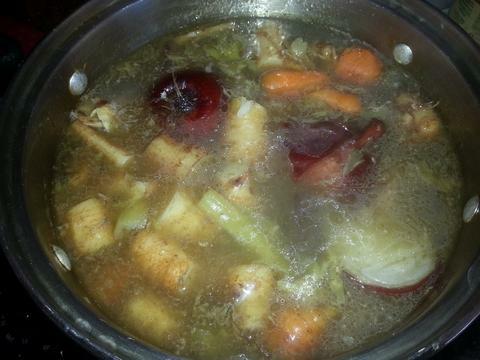 Bone broth can be made with chicken, turkey, beef, fish, or any other bones you have. My favorite is chicken and I make a batch of it almost weekly. My recipe for chicken bone broth is below. Can you use just any chicken bones? Sure, but do you really want to? If I'm going to be taking the nutrition out of the bones and infusing it into my soup I want my bones to be super healthy. I want them to be grass fed, pastured, and organic. Add the rest of your vegetables. strain all of the bones and veggies out of the broth - I just use a big pasta strainer into another pot to strain. Fresh young nettles are filled with nutrients, minerals, vitamins, amino acids and lots of protein. Nettles are packed with calcium, magnesium, chlorophyll and so many more minerals. Frequent use of nettles helps to stabilize blood sugar, reduce fatigue and restore your adrenals and kidneys. Make sure to cook them before you eat them or, yes, Stinging Nettles will sting you. Nettles are covered in tiny, hollow, needle-like hairs filled with formic acid that irritates people’s skin, producing red, stinging, burning welts that can last for hours. Cooking, drying, or freezing nettles renders them safe to eat though. As I was driving in my town the other day I found an enormous field of nettles growing. How amazing it is. I harvested some to use in my soup and to dehydrate for tea and when I went back to get more I couldn't even find where I had harvested as they are growing "like weeds" this time of year. Remember the plants want us to use them. They want to help infuse our body with their medicine so don't be afraid to use them. Find someone in your community that will help you to identify the proper species of herb to use and make sure you are harvesting in an area that is not sprayed with chemicals. If you're local and want to learn more about herbal medicine, we just began our spring series, contact me privately and we can talk. Leave me a comment below on your experience with bone broth and let me know how yours comes out.